Handling Tips: 50° F storage. Protect from cold. General Information: Basil (meaning "king" in Greek) is truly the king of fresh herbs. Basil is available in many flavors including cinnamon, lemon, and the beautiful, deep-purple, opal basil. Basil has a hint of licorice or anise that is the perfect companion with tomatoes. Along with adding to your favorite dishes, enjoy basil leaves fresh in salads too! Basil is the main ingredient in pesto. Nutritional: Travel sickness can be prevented by drinking a cold infusion of basil leaves before beginning a journey. Using the theory of like attracts like, it was thought that if a basil leaf was applied to a poisonous bite or a bee or wasp sting, it would draw the poison to it. Basil seeds were also thought to be an antidote to snake poison and were taken internally and laid on the bite. 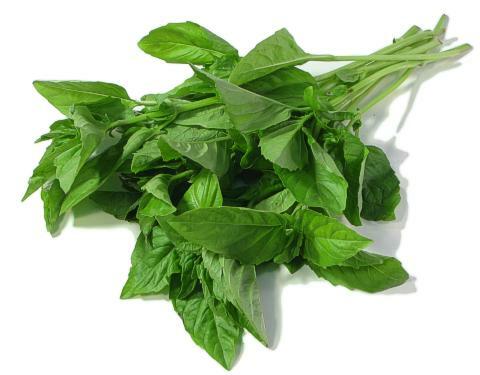 Ethnic: In India basil is sacred to the gods Vishnu and Krishna and is cherished in Hindu homes. Old superstitions linked basil with scorpions and it was believed that if a sprig of basil was left under a flowerpot, it would turn into a scorpion.